High frequency ultrasound systems are rapid, comparatively inexpensive imaging tool for studying normal development and models of human disease in small animals. 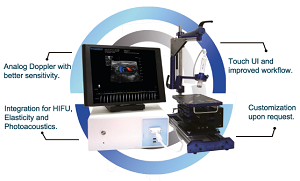 Applications of preclinical micro-ultrasound are explored for developmental biology, cancer, and cardiovascular disease. High Resolution Imaging System provides high spatial resolution up to 30μm, allowing researchers to observe the anatomical structures and hemodynamic functions of small animals.